The ADXR indicator supplied with NinjaTrader cannot be used with an input series other than price. We have recoded it so that you may apply it to other indicators. 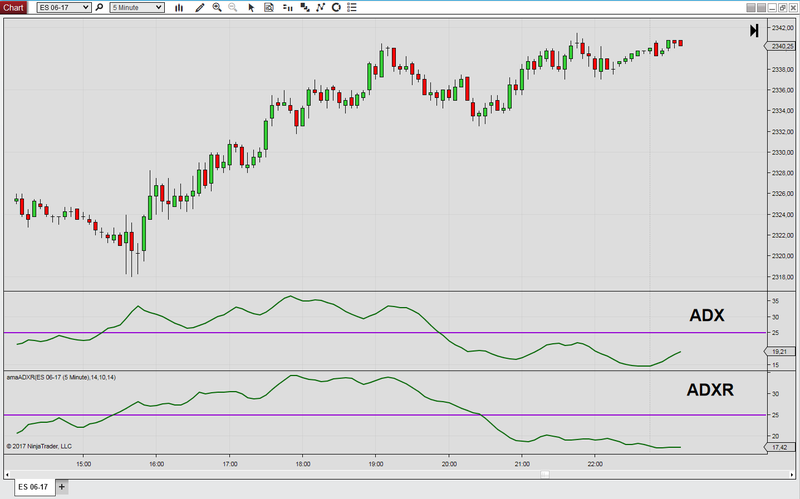 To do so, simply select any of the other NinjaTrader indicators as input series. The Average Directional Movement Index Rating (ADXR) is a component of the Directional Movement System as described by Welles Wilder. In addition to detecting the overall strength of the trend, the system also measures the strength of positive and negative price movement. The ADXR is a customized moving average (the WilderMA) applied to the ADX indicator, and is used to determine whether price movement is strong enough to consider potential trading setups. Therefore, the ADXR is especially useful when considering trend-following entries. Our version of the ADXR allows for setting the DM and ADX periods independently. Furthermore, this version of the ADX can be applied to other input series than price.